Submitted by: The Rev. 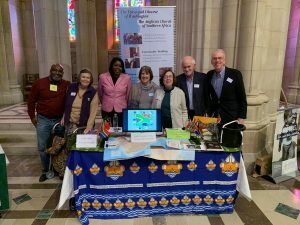 Betsy Hague, the Southern Africa Partnership Committee, the EDOW Environmental Network, and parishioners committed to creation care at St. Stephen and the Incarnation, St. Columba’s, St. John’s, Lafayette Square, and Ascension, Sligo Parish. To serve as a moral example in loving God’s creation and responding to the call to protect, conserve, and preserve this fragile earth, our island home. This resolution is intended to encourage individuals, parishes, schools, and other church-related organizations within the Diocese of Washington to recognize in their worship and prayer and by example, the biblical mandate to care for God’s creation. communities of faith, The Episcopal Church” needs to be “an example by making intentional decisions about living lightly and gently on God’s good earth;” and in an earlier June 1, 2017, statement, Presiding Bishop Michael Curry called on the Episcopal Church to take bold action to address the climate crisis, reminding us that we are all trustees and stewards of God’s good creation. In recognition of the Biblical mandate to be stewards of God’s good creation, the Archbishop of Canterbury Justin Welby and the Anglican Communion Environmental Network encourage participation by all within the Worldwide Anglican Communion in the Season of Creation, the period each year from 1 September (the Global Day of Prayer for the Care of Creation) to 4 October (St Francis of Assisi Day) to pray and celebrate with creation, focus on the story of the Earth, and commit to a ministry of healing the Earth. The Season of Creation was first adopted in 1989 by the Greek Orthodox Church and the concept has now spread to other denominations. Among other resources for celebrating the Season of Creation are worship liturgies and Sunday school lesson plans prepared by the Anglican Church of Southern Africa and the Anglican Communion Environmental Network. See http://www.greenanglicans.org/resources; and https://acen.anglicancommunion.org/resources/season-of-creation.aspx. There is recognition throughout the Diocese of Washington that God has commanded us to care for this fragile earth, our island home, ensuring cleaner air, cleaner water, and healthier soil for all people throughout the world. Many parishes, schools, and others within the Diocese of Washington are already following spirit-filled practices to care for God’s creation. Accordingly, it is appropriate for the Diocese of Washington to celebrate in our worship and prayer and by example, the care of God’s creation by adopting the foregoing Resolution for Creation Care. By so loving God’s creation, we believe that our individual and group activities and choices will increase the preservation and renewal of this fragile earth, our island home. This resolution will not impose any costs on the Diocesan budget.